Clicker training is a way of training your dog using positive reinforcement using a small plastic box called a clicker and a very large bag of different dog treats. 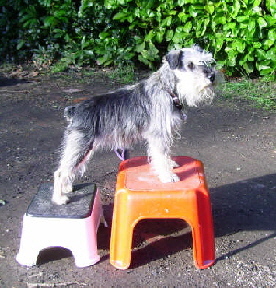 Dogs learn quickly and easily using this method - useful for every day good manners or to teach tricks to show off to your friends with. 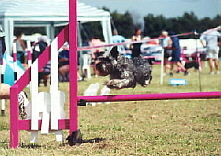 Where your dog negotiates a course comprising of jumps, tunnels, weaves and contact equipment. Please note your dog must be twelve months old to start as they have to have finished their growing before commencing classes. I am an accredited practitioner in the DAQ movement method. Ringcraft: Encourages better and correct movement. 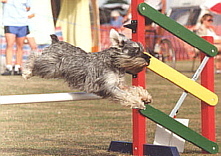 Agility: Encourages tight turns, speed and control. 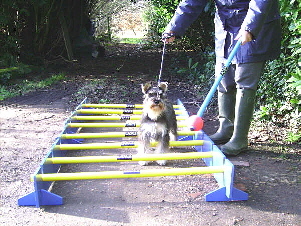 Keep fit classes for you and your pet in a fun environment. Please see the DAQ link on the Links page (or click here) for more information as this is still quite a new concept! All the above are sometimes available in groups or on a one to one basis. 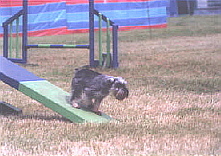 This site is © Copyright Topjax Animal Therapies & Devon Web Design 2006. All Rights Reserved.